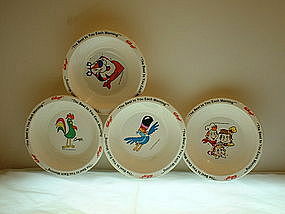 Kellogg's "The Best to you Each Morning" four cereal bowls featuring Tony the Tiger, Snap, Crackle, Pop, Corny, Toucan Sam were premiums from Kellogg's in 1995. The bowls have been packed away since 1995 and have NOT been used. Any questions please send email or call. Postage determined by your zip code. THANKS.